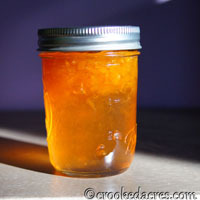 » Crooked Acres Jams & Preserves. This entry was posted on Friday, October 28th, 2016 at 7:15 am and is filed under Jams and Hot Sauces. You can follow any responses to this entry through the RSS 2.0 feed. You can leave a response, or trackback from your own site. Crooked Acres Jams & Preserves. Currently available jams and preserves. Note: All jams and preserves are $4 per jar. And shipping is SKY HIGH, due to the weight of the jars. If you’d rather make your own, shoot me an email and I’d be happy to share our recipe with you! (Hot jams are at the bottom of the page; shipping information & how to order is here). 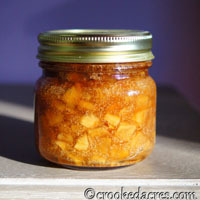 Pear Preserves – slices of pear (grown right here at Crooked Acres!) and lemon in a thick syrup. Fred’s grandmother used to make this stuff, and apparently ours is JUST like hers. We have a TON of this stuff available, because the trees went crazy this year. Note from Fred: The pears used in the preserves are Kieffer pears, grown here specifically because they’re the kind of pears both of my grandmothers grew. They make such good preserves because they’re very firm, and develop a supremely satisfying chew. However, there are occasional imperfections in the flesh that can make you think you got some grit. Know that that’s still pear, and not actual grit or dirt. Read more about Kieffer pears here. 3 jars available. 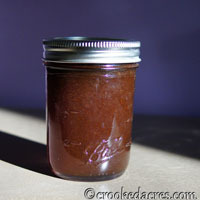 Caramel-Apple Jam: chunks of apple (grown here at Crooked Acres) in a thick caramel base – 1 jar available. 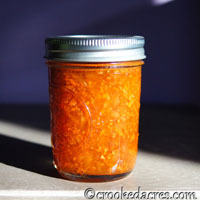 Carrot Cake Jam: shredded carrots, pineapple, pears (grown here) mixed together in a little jar of heaven – 3 jars available. 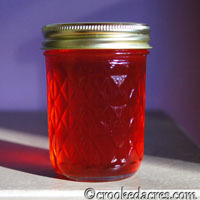 Candy Apple Jelly: apple-cinnamon jelly that is WAY too good (my personal favorite). 3 jars available. Muscadine Jelly: muscadines (wild grapes) grown here by us. 1 jar available. Simply Peach Jam: peaches grown here at Crooked Acres. 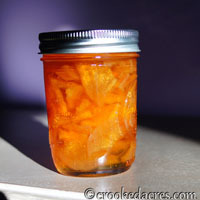 (Note: during the making of the peach jam, the peach pieces shrank and floated to the top of the jar. Just give it a stir when you open the jar to redistribute the fruit.) 3 jars available. 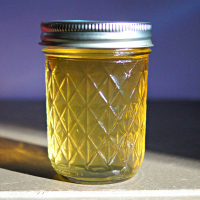 Honeysuckle Jelly. Our property is covered in honeysuckle every summer, and I happened across a mention of honeysuckle jelly so had to go looking for a recipe. It took a lot of picking (and a lot of complaining) to get enough honeysuckle blossoms to make an infusion, but I made Fred help. As far as I can tell, the jelly is supposed to taste like honey, but to me it tastes like tea. It’s certainly a pretty jelly. 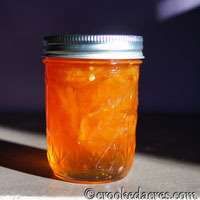 I won’t be making honeysuckle jelly again; it’s too much of a pain. 1 jar available. Hot – all of these were made with habanero peppers. Pearbanero Preserves – Pears and habaneros grown here at Crooked Acres in a thick syrup (please be aware that preserves are not the same as jelly/jam – they are in a syrupy liquid and can be poured out of the jar.) 8 jars available. 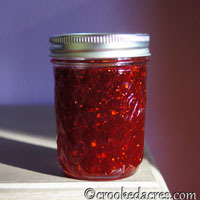 Scorchin’ Strawberry-Habanero Jam: locally sourced strawberries, habaneros grown here at Crooked Acres. 3 jars available. For ordering instructions, go here.